Schools and Districts: Join the State Electronics Challenge! Prospect Sierra School's Zero Waste Lunch Efforts - Now on Eco-Company TV! Did you know that K-12 schools in the U.S. generate about 10 million tons of waste every year?!?! Use our Zero-Waste School Events Infographic to reduce your school's environmental footprint. Events that are FUN don't have to make waste by the TON! The vast majority of this waste from school events - 82 percent! - is food and paper. Green Schools Initiative created this Zero-Waste School Events Infographic and Buying Guide to help tackle this problem, with support from World Centric. The Infographic shows you where the waste comes from and what you can do. The food waste from events at our country's 132,000 schools is enough to feed meals to 8.8 million people (assuming only 2 school events per school per year). And these events use 66 million forks - Yikes! That's a BIG environmental footprint! These are conservative estimates - think of all the sporting events, drama productions, back-to-school night, picnics, and other events your school hosts. Download the Infographic and Buying Guide and start shrinking your footprint and saving waste at your school events. Share with your PTA, student council, Green Team, fundraising team, sports teams, and more. The Zero-Waste School Events Infographic provides solutions for the waste problems of food, drinks, cups and plates, and utensils. It takes you through each stage for your event - plan, buy, set-up, and clean-up - and shows you how to reduce your environmental footprint every step of the way. The Buying Guide helps you find retailers that offer compostable foodware and other greener options. Every step you take saves! The Infographic has fun facts to inspire your action. For every pound of plastic disposables you avoid using, you save 2.5 pounds of global warming pollution (carbon dioxide or CO2)! One zero-waste school event can save 180 pounds of CO2 - that's like NOT driving a car 200 miles! If ALL schools held zero-waste events twice per year, we could save 50 million pounds of carbon dioxide emissions - like NOT driving a car 54 million miles!!! So, WOW your PTA and be a Zero-Waste Hero! 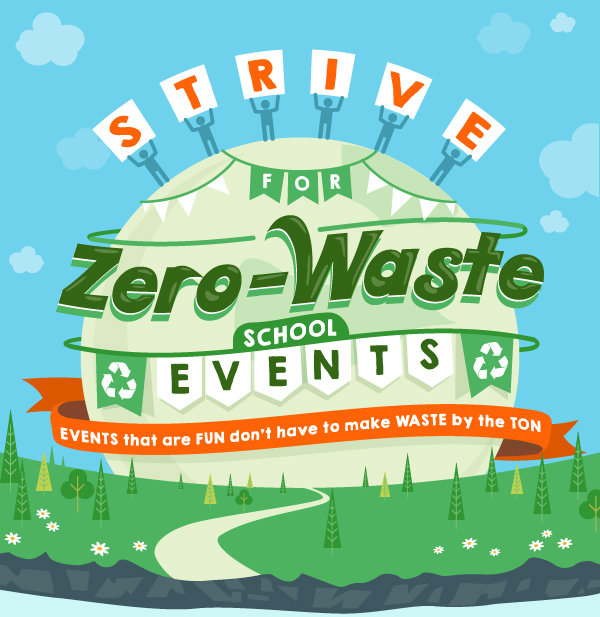 Get the Zero-Waste School Events Infographic and Buying Guide today! Learn more about the sources for the Infographic statistics here.